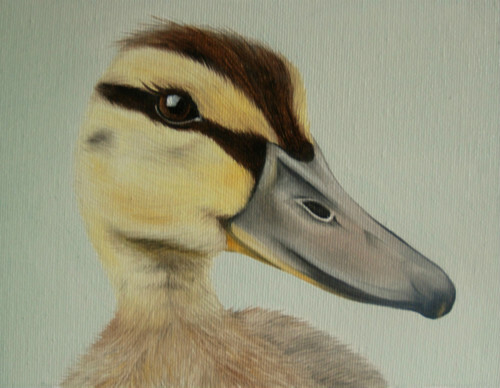 For those of you that remember Nancy and Tuffin will know I don't just love painting dogs and cows but love to paint beautiful Ducks too! "Wayward Duckling is a wild mallard who was found on her own at one day old, either lost or left behind by her mum. She was taken to a duck sanctuary in Dorset where she has lots of ducky company. Her favourite pastimes are snoozing in a furry hat, diving in her pond, scoffing mealworms and lettuce and looking cute." I think you'll agree she is completely adorable, just wish they could stay so cute and fluffy!! She's doing well under Zoes care and making lots of friends. I have also ordered some prints of Wayward Duckling which will be available soon, just contact me to order or for more information.